The Body Shop are soon to be releasing a new, limited edition range for the summer. The refreshing Virgin Mojito collection will feature four different skincare products, a fragrance and three gift sets. Click read more to check out the collection! The first two items that will be part of the Virgin Mojito collection are the Virgin Mojito Body Scrub (£15) that promises to "scrub away sticky sun cream and invigorate balmy skin" and the Virgin Mojito Shower Gel (£4) for a refreshing lather. Following up are the Virgin Mojito Body Sorbet (£8) for a cool blast of moisture that provides "skin-quenching hydration" (check out my review of the Satsuma Body Sorbet) and the non-greasy, non-sticky, 24hr moisture Virgin Mojito Body Butter (£13). Last and not least is the Virgin Mojito Splash (£16) which is an "innovative new fragrance format inspired by the beautiful beach bodies of South America." Splash on generously post-shower to extend the refreshing scent of the Virgin Mojito range so that it lasts throughout the day. In addition, the items from the collection will also come packaged up in three different gift sets that suit all price ranges. The Cool Cube (£8) will feature a 50ml Body Butter, a 60ml Shower Gel and a Mini Bath Lily. The Big Shake (£25) comes packaged in a metal cocktail shaker (that you can use afterwards!) and will include a 50ml Body Butter, 50ml Body Scrub, a 250ml Shower Gel and a Mini Bath Lily. The Big Splash (£45) comes packaged in a large drinks bucket (which you can also use afterwards) and includes a 200ml Body Butter, 250ml Body Scrub, a 250ml Shower Gel, a 300ml Body Splash and a Bath Lily. 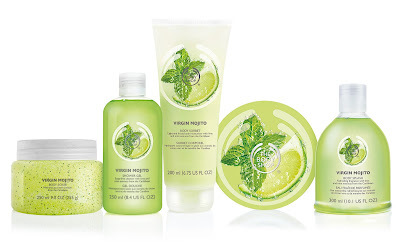 The Body Shop Virgin Mojito range will be in stores from 5th June 2015. EDIT: The collection can now be purchased from The Body Shop. What are your thoughts on the new Virgin Mojito range? Which product do you want to try out the most?